New UWP candidate for Roseau Central, Soso Cuffy: "It's a long road ahead"
Glenroy "Soso" Cuffy has always been in the background pushing other people forward; now his time has come to be pushed by his supporters and friends. Cuffy has been nominated to be the candidate for the United Workers Party (UWP) in the Roseau Central constituency replacing Joseph Isaac who in April ditched his party and walked over to the ruling Dominica Labour Party. In an exclusive interview from the UWP headquarters on River Street, Soso, as he is popularly known, said he is an ordinary guy. "I was born and raised in River Street, the son of Shirley Shillingford. My adopted mother's name is Ramona Graham. I attended the St. Mary's Academy (SMA) and all of my life has been River Street and Roseau. I have enjoyed the glory days of Roseau when the Roseau River was a beauty to watch and behold as it poured into the sea," he said. Cuffy said he grew up among the young boys and girls of Roseau and he was involved in all sports to include marble hole, cards and dominoes. "We played skip and hop scotch. Those were the days and much more. That's who I am, that ordinary and humble man from River Street. I have grown to understand that life is not just about games but doing what you have to do and what you make it. So after high school at the SMA, I moved on to work with the banana industry where I spent 20 plus years, I also did university studies during that time," Cuffy said. In the banana industry, he worked in the production department, in quality control, water management (irrigation) and leaf spot control. "It was a lot…I have paid my fair share of taxes in this country and the last time I checked the Social Security they told me that I am qualified for benefits," he said. "I have always seen myself as someone who can make others win in politics and I am surprised that I have reached thus far in politics. I have never counted myself as being a candidate; however, given the unfortunate circumstances with Joseph Isaac, soon after that happened I got a spiritual call that told me something that I suspect that your time is coming. 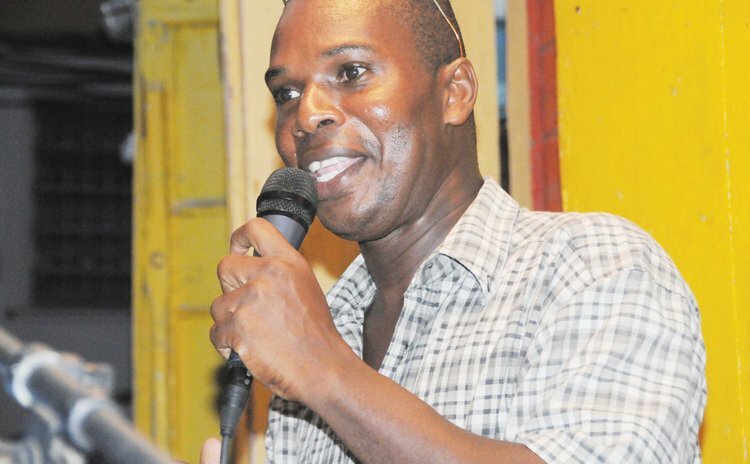 Soon after, the Roseau constituency association came together and told me "Glenroy "Soso" Cuffy you will be the candidate," he said. He continued: "So first that spiritual intervention and then my constituency association…I consulted with a few close friends and members of my family and they have all given me their blessings to be a candidate on the UWP ticket for the next general elections. "I believe in the principles and ideals of the UWP and you know what struck me to being party of this party, it's their motto and ideals, where people come first. Let me say this; I am not into politics for money, I don't need politics, I am doing it for the people, people come first." Cuffy, 49, is a divorcee and has no children. He holds a Bsc degree in Management Studies from the University of the West Indies. He's a consultant and a farmer. Cuffy said that he has been around since Norris Prevost who ran for the UWP in Roseau Central and they worked together, walked the streets and corners of Roseau, met and talked to the people. "Norris Prevost is the godfather of motivation; he has motivated us and always reminded us that we have the people's work to do," he said. "Once you are trust-worthy and honest and doing the people's work you have nothing to worry about. I am now embraced by the people's power, I feel strong by the people's power; yes, we have hurdles but I am not moved. Joseph Isaac always says that the UWP needs cleansing and I thought to myself 'maybe that is one of the moves to cleansing the party by persons removing themselves from the party if they feel they are not going to do justice'. "It's a long road ahead. I won't be complacent .I will be on the ground and doing the people's work, meeting the people, hearing their concerns and doing what I have to do. "I trust the people despite the fact that people, given what have happened, don't trust politicians. I am a name of trust and integrity. I expect a few humps along the way but I'm confident at crossing over them and succeeding," Cuffy said.